It seems the whole world has seen or read something about Joe’s KC Bar-B-Que. When we think of barbeque restaurants nearby, this is one of the most well-known. A visit to one of their restaurants will usually result in taking a turn at the waiting game. Although the lines may be long, Joe’s staff has refined the ordering process to a fine art. This helps them serve the largest number of customers in an efficient manner. Even though their delectable dishes are familiar to many, the story of their rise to fame is less well known. Kansas City is a BBQ town. The smoke of hundreds of grills rise above our sports stadiums on game day. 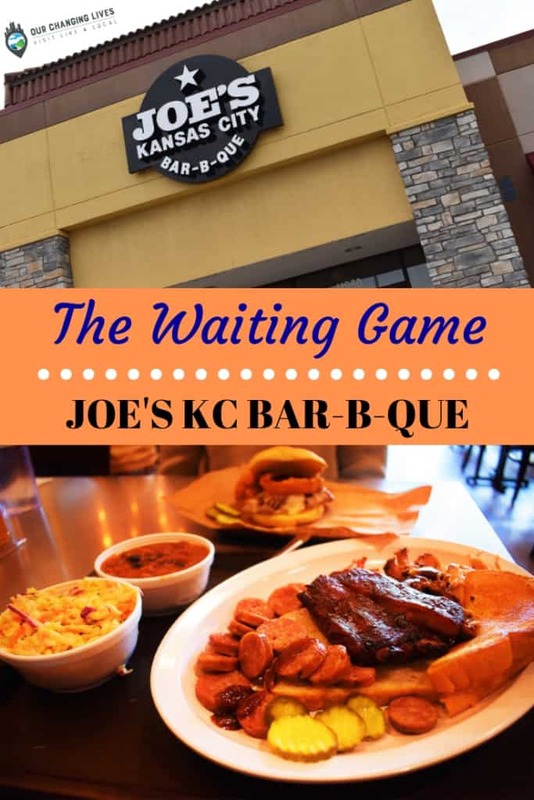 New barbeque restaurants appear regularly, all with the hope of rising to the national acclaim of Joe’s KC. Many rely upon the laurels they receive at barbeque competitions and invitationals to fuel their success. (You can read about another contest winning BBQ here.) 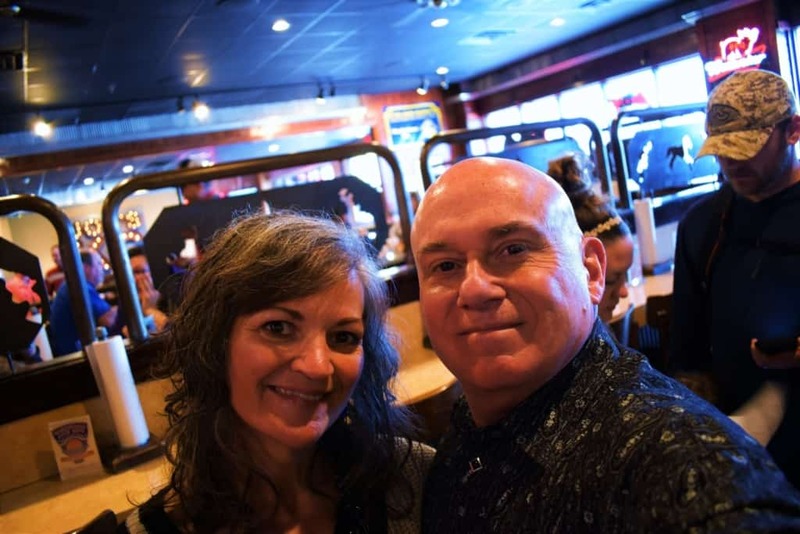 Jeff and Joy Stehney were bit by the barbeque bug after attending their first competition. Their passion grew to the point that they started their own team, and Slaughterhouse Five was born. Before long, their collection of awards were piling up. On the BBQ circuit, competitors often become friends. Striking up a relationship with the founder of the Oklahoma Joe’s Smoker Company provided the opportunity for the Stehneys to enter into the restaurant business. By 1996, their first store opened in Stillwater, Oklahoma. The legend of Oklahoma Joe’s BBQ had begun. They wouldn’t have to play the waiting game before their next break would appear. It was less than a year later, when a space inside a local Kansas City gas station became available. Being close to their home, this was the perfect fit and Oklahoma Joe’s BBQ launched in Kansas City. The business partnership ended when the owner of the smoker company sold his share and moved to Texas. 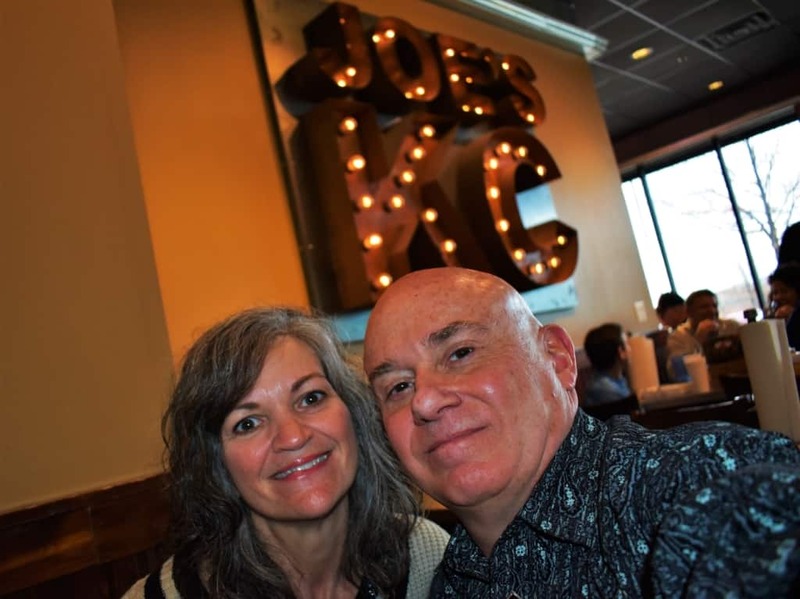 These days there are three Joe’s KC Bar-B-Que locations, and that seems to be the way the Stehneys want it to stay. With the Oklahoma restaurant closed up, it made perfect sense to change the name to fit their hometown. With all of this history behind us, we found ourselves sitting inside their Olathe location. We had played the waiting game, as we joined the hungry crowd yearning for a lunchtime meal. The line moved steadily, and it didn’t take long for us to get our turn at the counter. The time in line allowed us a chance to determine our choices, and soon we were at a table ready to dine. Of course, first we need to get photos. The Z-Man Sandwich is quite a treat. 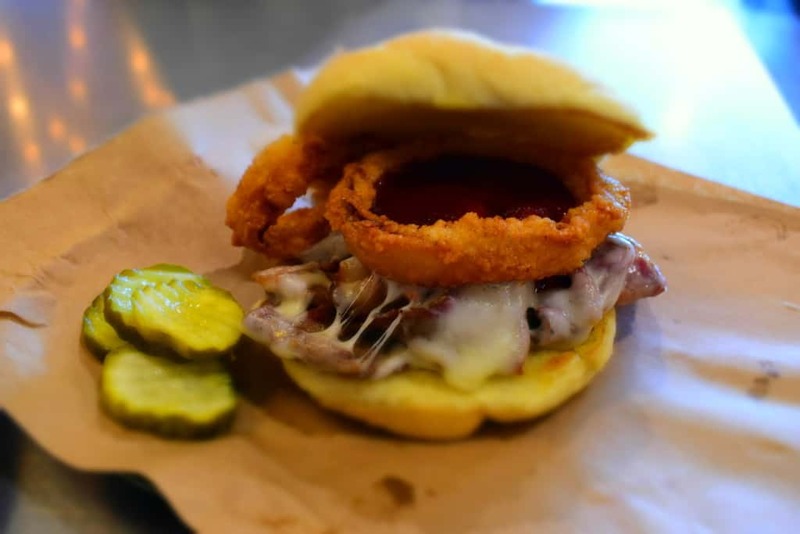 Smoked beef brisket is topped with provolone cheese, two crispy onion rings, and a dollop of sauce. To commemorate the creation of this masterpiece, a contest was held to name it. Mike Zarrick, a local sports radio jockey, played up the new sandwich on air. With a growing audience and a cool nickname, the Z-Man feverishly promoted Joe’s and their sandwich. By the end of the contest, the name Z-Man became the way many people would order the sandwich. Although a different name was chosen, it would eventually be changed due to customer preference. This flavor packed creation has good reason to be crowned the champion of barbeque sandwiches. The best way we have found to sample any BBQ joint is by choosing one of their sampler style platters. At Joe’s KC Bar-B-Que, the Hogamaniac offers up a plate full of smoked goodness. Pulled pork, smoked sausage, and ribs are accompanied by a choice of two sides. To keep close to barbeque tradition, we picked the BBQ Beans and Creamy Coleslaw. For us , the true test of BBQ is the ability to enjoy it “naked”. The addition of sauce can be made in some instances, but the smoke flavor needs to be able to stand up for itself. With our waiting game over, we dove into our delectable dishes. These days, the Stahneys continue to share their love for barbeque with as many as possible. 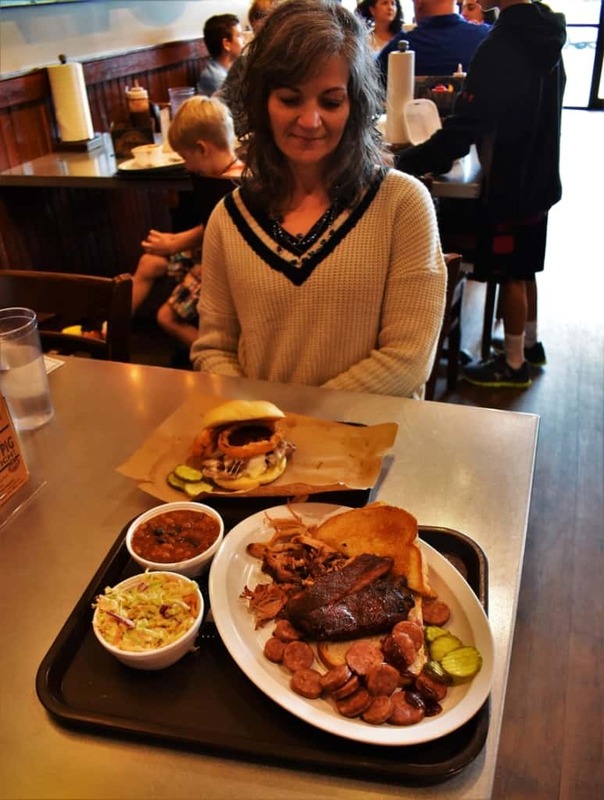 The magic of the smoke still captures their hearts, and is the drive behind their desire to create the best barbeque in the Midwest. With this passion still burning, each day brings them another chance to create new fans. As with any cuisine, BBQ lovers have their favorites and many hold allegiance to only one or two. We have found a love for all barbeque, since each location will have its own unique flavors. Places like Joe’s KC Bar-B-Que help spread the message of Kansas City barbeque far and wide. In the end, this type of notoriety helps keep the KC BBQ spirit alive and growing. 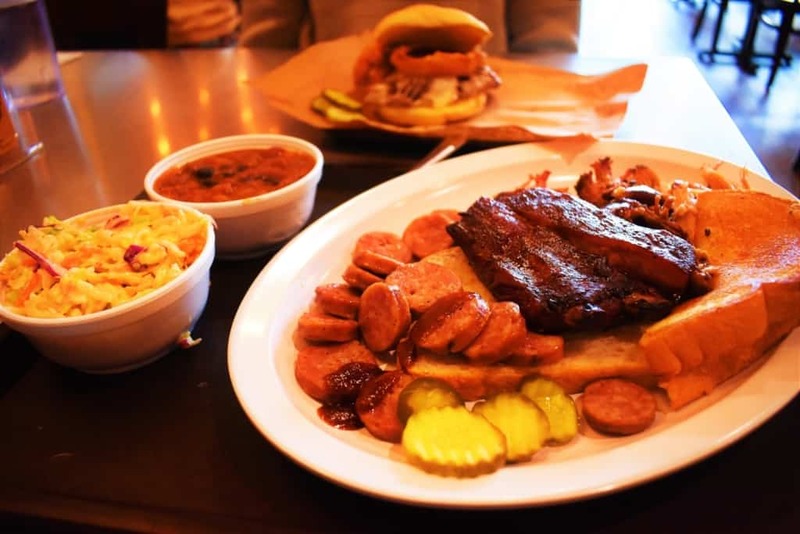 What are some of your favorite Kansas City barbeque joints? Share this you BBQ loving friends! Mmmmmm, BBQ. I am hoping to roll through KC later this year and I will be sure to stop at Joe’s. Hope you enjoy it. Be sure to try out some of the others while here. You can bring a cooler and take home some meaty treats. Always enjoy showing off places we have discovered to you when you visit. When we visited our friends in KC a while back, they insisted on taking us to Joe’s. It lived up to their reputation. Burnt ends…MMMM good. So happy to hear that your taste buds were satisfied. We Kansas Citians pride ourselves with our barbecue. Thanks for sharing. Hope you have a chance to sample it some day. We have nephews in KC and we stand in line at Joe’s every time we visit them. There’s the history, and there-s the special BBQ flavor, but I also have about the sides!!! So glad you have had a chance to sample some true Kansas City flavors. The photos left my mouth-watering and me lusting for BBQ and it isn’t even 7 a.m. in Greece! Wow! Hopefully you can grab a quick flight to our area and satisfy that urge. Lol! So glad you enjoyed the article. That plate looks so fabulous guys. I can just taste it. Nice change up from all the veggie curry I eat here in Thailand. 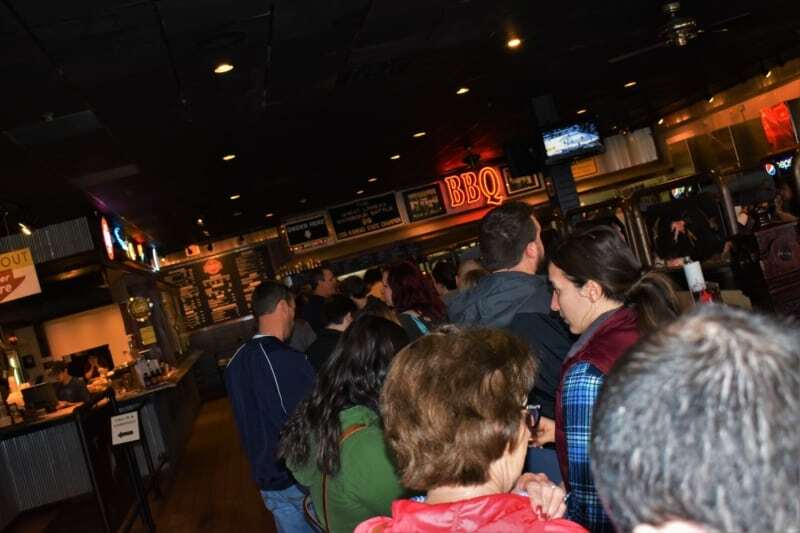 Perhaps you will get a chance to enjoy some KC Barbecue some day. I’ve lived overseas for 20+ years and don’t miss much about the US, but I miss proper BBQ. Joe’s KC BBQ sounds like the real thing! Rachel, it is the real deal. If you ever make it back to the US, you need to set your sights on some Kansas City BBQ.